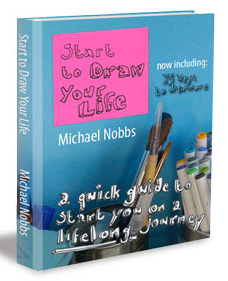 As part the aforementioned exercise routine, I plan to start off each day reading this new e-book courtesy of the ever-so-willing-to-share-his-talents-and-sketches-Michael Nobbs. [You may remember that I posted about Michael's journals before.] Not only is it full of great advice on recording life through drawings...it's free! Definitely cheaper than a gym membership. Thank you for spreading the word, Suzanne. LOL @ what Michael said about the biceps workout!